Is Zero4U Compatible with Raspberry Pi Zero W? Zero4U is a popular add-on for Raspberry Pi Zero, and it can be mounted to Raspberry Pi Zero back-to-back to provide 4 standard size USB ports. So, is Zero4U also compatible with the newly released Raspberry Pi Zero W? The short answer is, YES with the help from a ferrite ring, which we will put into every package of Zero4U since today (2017.3.9). This ferrite ring will be free of charge. If you want to know the details, please read on. After we got our first Pi Zero W, we mounted Zero4U underneath and we confirmed the 4 pogo pins on Zero4U are contacting those testing pads on Pi Zero W very well. So far so good, isn’t it? After some investigations, we realised the problem relates to the network activity. As we connected to the Pi Zero W via SSH, every time we execute a command in the SSH session, the USB devices on Zero4U will be reset (white LED down and later restore). 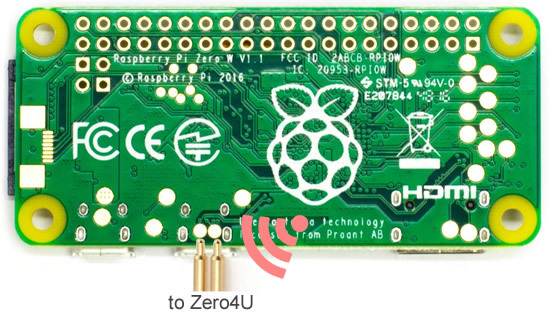 If we turn off the WiFi on Pi ZeroW, Zero4U will work very well. 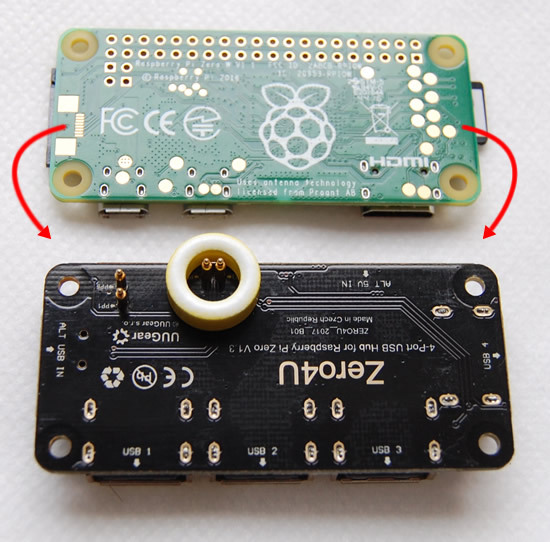 We also noticed that, if we connect Zero4U to Pi Zero W via USB cable (instead of via pogo pins), the problem will disappear. All these facts lead to one conclusion, that Zero4U is being interfered by the WiFi radiation, and that interference is introduced via the two pogo pins on PP22 and PP23, which are very close to the WiFi antenna on Raspberry Pi Zero W. When there are more network activities, the WiFi radiation becomes stronger, and the two bare pogo pins will work as antenna and receive some high frequency noise, which will make Zero4U unstable and fail. After we understand the problem, we tried many approaches to solve it. Finally, the best solution we’ve found, is to put a ferrite ring on that two pogo pins. This ferrite ring can shield the two pogo pins and avoid the interference. In the picture above, we used a ferrite ring with 13mm outer diameter, which is kind of too big for this purpose. We use it just because we couldn’t get one with suitable size in such short time. 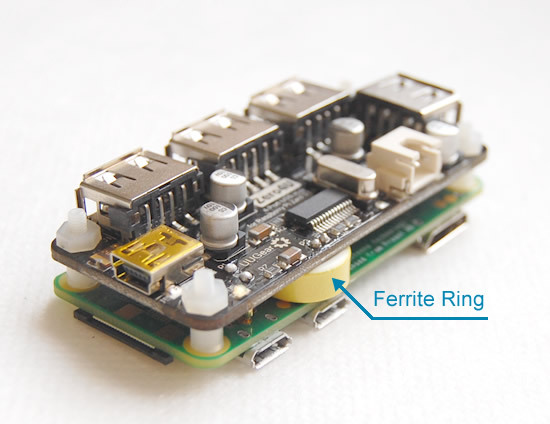 The ferrite ring that we will put into Zero4U package, will be much smaller and has only 7.6mm outer diameter. The ferrite ring has the same thickness with the spacers, so it doesn’t affect the assembly. After using the ferrite ring, the testing result becomes perfect! Zero4U works very well with Raspberry Pi Zero W. We opened Web browser in Pi Zero W desktop and play Youtube video there, that way the network activity kept very high. The USB devices on Zero4U are all working normally and we never see a USB device get reset during the 4 hours test. We have some Zero4U in stock, but we don’t have the ferrite rings yet. We are sourcing the suitable ferrite rings and hopefully we will have them soon. Meanwhile we configure Zero4U product to accept back-order, so we will have some time to prepare the ferrite rings. If you don’t want the ferrite rings (i.e. 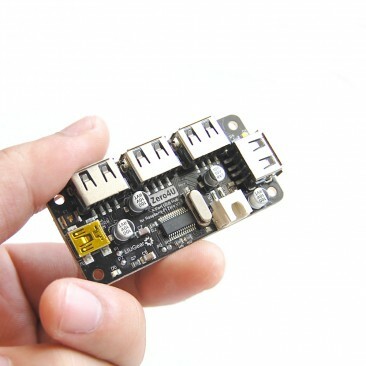 you don’t want to use it on Pi Zero W), you can contact us after placing the order, and we will ship your order without the ferrite. If you purchased Zero4U before 2017.3.9, and you want the ferrite ring, please contact us. We can send you the ferrite ring if you are willing to pay the shipping cost, or we can send it with your new order together, if you are going to place one. It is also possible that you source the ferrite ring by yourself. We realised that many ferrite rings in the market could be used for this purpose, as long as the sizing is suitable. The most important parameter is the thickness of the ring, which should be 4~5mm (4.5~4.7mm will be ideal). Inner diameter should not be smaller than 3.3mm. The outer diameter is not that important but smaller will be better. We have the ferrite rings in stock and start to offer them to existing customers for free. Product link is here.